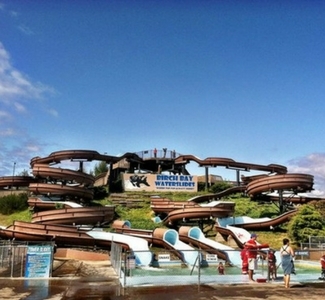 The Birch Bay Waterslides is a fun and family friendly waterpark located in beautiful Birch Bay, Washington. There are 9 different slides, a pool, a hot tub and kiddie pool area -- and, the water is heated! The park also includes a gift shop, concession stand, volleyball and basketball courts. For visiting recreationer's, a pizza restaurant is conveniently located right next door. The facility offers great group rates, birthday party discounts, military & non profit rates, a family friendly food policy, and more!